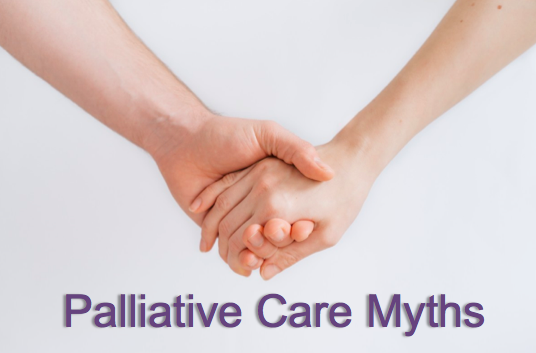 5 Palliative Care Myths DEBUNKED! Image Credit: “Reconceptualizing palliative care as a continuum of support”Wang, David H., MD. Published March 31, 2017. Volume 69, Issue 4. Pages 437-443. End-of-life care is only one of the many components of palliative care. Palliative care consists of interdisciplinary efforts to decrease the physical, spiritual, and psychological stress related to an incurable or chronic illness. Sound familiar? We do this daily in the emergency department (ED) for a variety of patients with acute on chronic conditions, many of whom would benefit from early palliative care involvement. Despite multiple studies illustrating the benefit of early palliative intervention, palliative care has traditionally been offered late in one’s disease course, thus creating the misperception that palliative care is synonymous with hospice, or end-of-life care. Specifically, hospice is a benefit and program for patients whom providers believe are prognostically likely to live less than 6 months if the disease is to run its usual course and are philosophically inclined with not pursuing further life-prolonging interventions. Many conditions and disease states could benefit from the model proposed below, with palliative care offered in tandem with life-prolonging care in order to ease symptom burden and improve quality of life. As someone’s chronic illness starts to worsen with concern that their time may be getting shorter, palliative care can then transition to planning for end-of-life, including discussions about enrolling in hospice. Within the landscape of modern disease shifting towards long term management of chronic disease, emergency medicine and palliative care are beginning to share increasing common ground. Many of these patients present to the ED on a regular basis, making the emergency department a unique access point for initiation of early palliative services. As mentioned previously, palliative care accomplishes much more that just what happens when a patient has cardio-respiratory compromise. The exact actions performed at the very end of life are not as significant as identifying the values that inform patients and surrogate decision making. It is better to avoid jumping into a goals of care discussion with questions such as “Would your loved one like everything done?” or more gore filled specifics of “Do you really want us beating on their chest or shocking them with electricity to try and keep them alive?” No one would like to approach the context of their goals for treatment and care framed as a series of end of life checkboxes and procedures. Rather, palliative care providers stress the importance of identifying what’s important to patients and families with the worsening of their disease progression, in order to fill the gap between expectations and reality. While it is important for us as ED providers to understand how a patients’ wishes relate to medical interventions, we must remember that collaboration and the development of mutual trust are needed to provide excellent care. Trust is achieved through verbal communication style and through non-verbal cues such as sitting with the patient and/or family and giving them time to communicate their wishes without haste or decision-steering conversation. Attempts should be made to identify broad goals that are important to the patient and family. Building on those principles, providers should then propose appropriate goals of treatment based upon expectations. Once trust and rapport are developed and the goals of care identified, providers should elaborate on a plan as well as timeline just as you do with all ED patients. If your patient's goals are more aligned with comfort and aggressive symptom control at the end of life, future discussions should establish code status as well as discussion of initiating hospice services be it as an inpatient or outside the hospital. . When speaking specifically of code status, a “Do Not Resuscitate” (DNR) specifically comes into play when the patient’s heart stops beating, even though it is often misconstrued as a theme for withholding treatment of any kind at the end of life. Thus, discussions for withholding interventions at the end of life should include discussion of not only code status, but also of discussion issues such as artificial nutrition/hydration and use of antibiotics. If appropriate, most emergency departments have a case-management based approach to initiate a hospice referral. Often, this is done in concert with the admitting team and/or palliative care providers to guarantee a smooth transition and often may require the patient to be admitted for setting up these services. Future directions will look to establish formalized care patterns for the initiation of hospice services in the ED to reduce hospitalizations for individuals at the end of life. If the patient’s or family’s goals align with ensuring they live as long as possible or continue for hope of curative treatments, then it would be prudent still to offer your perspective of prognosis and document this discussion for future providers that may come in communication with the patient in the future. This certainly does not preclude trying to get palliative care involved with the patient as they can continue to follow the patient even if he is pursuing life-prolonging therapy in anticipation of a change in disease progression in the future. For the emergency physician, identifying the broad goals of care in a criticallyi ill patient helps to delineate what specific interventions should and should not be done in the ED and furthermore during their inpatient stay. Identifying that CPR and intubation aren’t in line with the patient’s goals is critical first step if that intervention could happen in the ED. ICU level of care is not determined by this, but rather based upon the amount of intensive nursing care which will be required for that patient as well as frequency with which medications must be administered. Often times if patients are pursuing life-prolonging therapy, a short ICU stay is necessary to further discussions with inpatient ICU and palliative care providers as they de-escalate use of technology at the end of life and transition to aggressive symptom control. In the end, most ICU doctors have an informal fellowship themselves in palliative care and feel comfortable with admitting these patients knowing that their goals and their disease trajectory may change acutely. It is important however to be explicit with specific discussions that have already taken place and what decisions may have been made based upon these discussions as to help the accepting service provide better care for these patients. What do you understand about your condition? How do you normally spend your days? How much has that changed over the last month? What is most important to you (your loved one) right now? Validate the patient and their loved ones continuously; acknowledge their challenges to date and what they have accomplished to get to that point. Utilizing this value framework will allow you to consider treatment options from the patient’s perspective in the current medical context. Discuss these options and then recommend a course of action based on both your medical knowledge and your understanding of the patient’s values. Finally, remember that emergency medicine is a team sport--get your colleagues from social work and pastoral care involved early, so that they can assist in the established care pathway. This myth goes back to the 5 minute goals of care conversation. After establishing wishes and mapping out care goals broadly, it is imperative care providers take the role of adviser rather than host in terms of care. It is key to understand that this does not mean to be irreverent or negligent of a patient or family's wishes. Rather, when the goals of care and treatment have been established and the rapport developed, this is the time you give your professional opinion about the best course of action. If, with the appropriate patient with an incurable disease, you feel the patient would benefit from increased palliative measures and less invasive care you need to communicate that to the patient and family. Connecting their broad reaching goals with actionable palliative interventions such as pain control, dyspnea control, and secretion control will help build the sense that the providers are not “doing nothing” simply. With concerns and care issues validated you can build on issues and also discuss critical invasive interventions that would not help the overall prognosis and lead to prolonged suffering such as intubation, mechanical ventilation, and central line placement. As an ED provider, it is imperative we have discussions about interventions which could directly change the patients trajectory in the hospice such as the procedures detailed above, but more chronic life-prolonging therapy is best guided by the patient’s primary oncologist or in concert with their primary care physician. My recommendation is to make sure you have done due diligence to try to get these individuals in discussion if possible as to have appropriate follow up for future conversations. While these “myths” being debunked likely didn’t leave any physicians in shock or awe, it’s important to realize many of the underlying concepts get lost in the chaos that is the emergency department. Remember the ED sets the pace and tone for a lot of care delivered in a hospital system and establishes a patients trajectory through the greater hospital system. By taking a step back and remembering the principles and benefits of early palliative care, a substantial impact can be imparted on patients and their families that will increase patient satisfaction, and provide better resources that align with their wishes. [Peer-Reviewed, Web Publication] Zaidi H, Marshall A (2018, March 12). 5 Palliative Care Myths Debunked. [NUEM Blog. Expert Review by Chandrasekaran E ]. Retrieved from http://www.nuemblog.com/blog/palliative-care. Posted on March 5, 2018 by NUEM Blog and filed under Palliative Care and tagged palliative care end of life care hospice DNR goals of care.